Plenty to celebrate from Felix Auger-Aliassime. AT just 18 years old, Canadian youngster Felix Auger-Aliassime is already set to rewrite the record books. The young gun has a record which would be the envy of many tour veterans but after beating world no. 13 Borna Coric 7-6 6-2, he has reached the semi finals of the Miami Open. It makes him the youngest Miami sem-finalist in the tournament's history. It continues an incredible run for Auger-Aliassime. The scalp of Coric was his second straight victory over a top 20 player and after five matches against top-20 ranked players, he has a perfect record. Auger-Aliassime defeated Lucas Pouille when he was world no. 18, Fabio Fognini (16), Stefanos Tsitsipas (10) before adding Nikoloz Basilashvili (19) and Coric. He'll be going for a third straight win over an elite player when he comes up against world no. 9 and defending champion John Isner. Auger-Aliassime won through as a qualifier but his incredible run has him expected to move up inside the top 35 in the world. "Playing Borna, who's been established for a few years now, I definitely didn't expect to win," he said after the win. "I expected more, a set like in the first. But the second really surprised me. I felt like I had margin over him, had a bit of an edge. I just felt really comfortable out there from the first balls." What a start to his career. 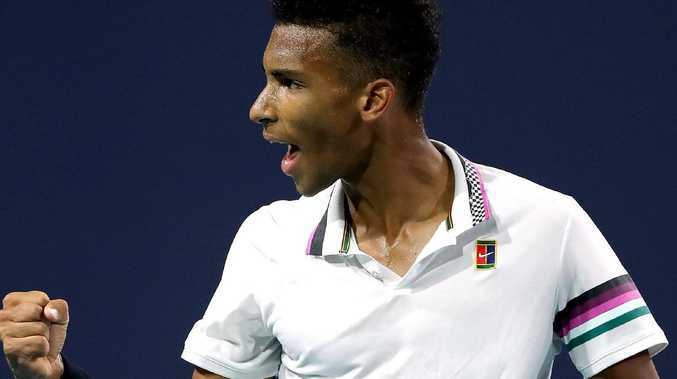 Auger-Aliassime will now have a day off before facing Isner, with Kevin Anderson and Roger Federer and fellow young guns 21-year-old Frances Tiafoe and countryman Dennis Shapovalov, 19, playing in quarter-finals tomorrow. 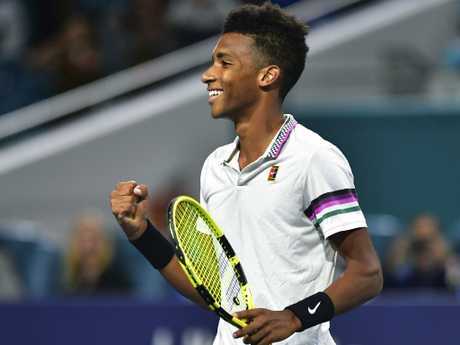 Auger-Aliassime was also the first player born in the 2000s to make an ATP Masters 1000 quarter-final, and the youngest since Andy Roddick in 2001 in Miami. Having moved into the semis, he's now the youngest to make the semis and hopes to beat Rafael Nadal, who was also 18 when he lost to Roger Federer in the final of the tournament in 2005. "Everyone is super excited back home," Auger-Aliassime said. "It's great to hear all these good comments from them. It puts a lot of belief in tennis in Canada. "It's a privilege to be compared to all these great players. I think it just shows that I'm doing good things, I'm on the right track. But I think I'm seeing the long term, and right now I'm just enjoying every day, enjoying every match, because you never know what's going to happen next." After his win over Tsitsipas, former British no. 1 Greg Rusedski predicted the 87kg, 1.91m star will continue to rise. "By the end of this year, this guy could possibly be top 10 (in the world), if not the following year," Rusedski said. "That's how good this guy is. You look at the rotation he puts on the forehand, it's a little bit like Rafael Nadal. But a right-handed version. "A great attitude, great composure and also a great team around him is also a key ingredient. "He's such a specimen and he moves incredibly well. Having spoken to a lot of the coaches in Tennis Canada, they all said to me this guy is the best athlete we've ever seen on a tennis court." Asked about his secret earlier in the tournament, Auger-Aliassime said it was simple. "I think (it's because) I'm not really scared of losing. It's part of the game," Auger-Aliassime said. "When I go in a match, I always look forward, always try to look for the best outcome. So in a way I'm able to stay in the present and enjoy the game. "I try to play good tennis every time I'm out there on the court, so that's been my way of thinking and that's how I play my best tennis as well." The Miami Open is live on Kayo Sports. From just $25 per month for two devices at once, Kayo is available on Apple and Telstra TV, for Apple and Google Android smartphones, on web browsers and via Google Chromecast Ultra devices. Click here to trial it free for 14 days.